BRACKNELL, UK. 13th November 2018 – Panasonic today announced a new partnership with Rohde & Schwarz Cybersecurity, an IT security company that protects enterprises and public institutions around the world against cyberattacks. 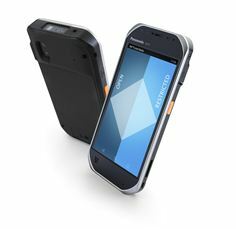 The partnership will see Rohde & Schwarz Cybersecurity equip the latest Panasonic Android devices with R&S Trusted Mobile, an Android-based, secured (“hardened”) operating system. The best of breed collaboration builds on Panasonic’s 20-year reign as market leader in Europe for rugged notebooks and tablets and couples this with Rohde & Schwarz’s trusted mobile software which offers a leading solution for securing mobile devices and protecting critical communication. The solution addresses the concerns of organisations that require rugged, durable devices, with maximum availability, whilst meeting the software security demands of the modern business. Rohde & Schwarz Cybersecurity is an IT security company that develops technologically leading solutions for information and network security, including highly secure encryption solutions, next-generation firewalls and firewalls for business-critical web applications. The certified IT security solutions range from compact, all-in-one products to customised solutions for critical infrastructures. Rohde & Schwarz Cybersecurity is an IT security company that protects enterprises and public institutions around the world against cyberattacks. It develops and produces technologically leading solutions for information and network security, including highly secure encryption solutions, next-generation firewalls and firewalls for business-critical web applications, innovative approaches for secure work in the cloud, and desktop and mobile security. The award-winning and certified IT security solutions range from compact, all-in-one products to customized solutions for critical infrastructures. To prevent cyberattacks proactively, rather than reactively, the company focuses on developing its trusted IT solutions according to the security-by-design approach. More than 500 people are employed at locations in Germany, France, Spain and the Netherlands. R&S® is a registered trademark of Rohde & Schwarz GmbH & Co. KG.